FAA Part 23 structural testing for a Grove landing gear. 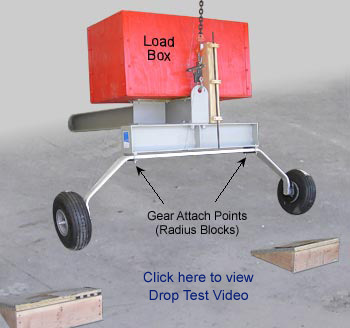 This page and the accompying video document limit and ultimate load testing for a 1,750 pound aircraft certified under FAR Part 23. You will be amazed at the spring capability and strength of the landing gear. As you watch the video pay particular attention to the deflection of the center section. This is important for two reasons. 1. Be sure that you have adequate clearance for this deflection. 2. 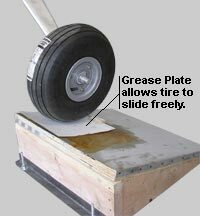 Radius plates or blocks are required at the attach points to allow the gear to flex without transmitting torsional loads to the fuselage. This photo shows the gear deflection and the need for center section clearance and radius plates or blocks. The gear is dropped on an angled ramp to simulate both the landing vertical and drag loads.